Twitter Marketing - What have I done wrong? Twitter is a city that never sleeps. Everything is running 24/7/365 days without skipping a day work. People are constantly on Twitter regardless for business, leisure, knowing the latest news or even communicating with one another. You may have heard that Twitter is dying soon. While that may (or may not) be true, it still doesn’t change the fact that Twitter is a powerful social media platform. As long as Twitter is still up and running, you should always find more ways to generate leads and improve traffic using Twitter. 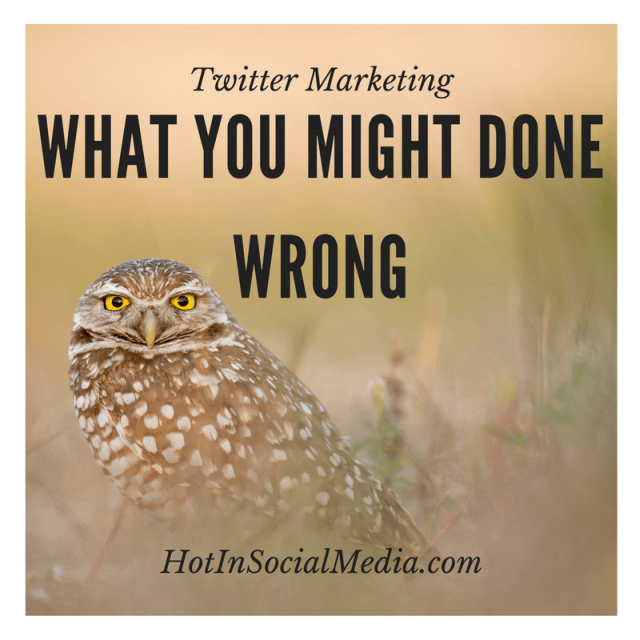 In this post, we will discuss on mistakes you might have done on Twitter and how you can improve your overall Twitter marketing. And it makes sense! How does this relate to the auto welcome message? Twitter literally opened up the character limitation in private message and boom, most of us decided to spam it with a super long, auto welcome message. Here’s the thing. A good auto welcome message is hard to pull off and that’s the fact. Most of the time, it is the generic one of “Thank you …” or “Appreciate the follow…” and I’m sure you can relate to this. In most cases, an auto welcome message is a complete turn off for many! Want to be better at Twitter? Don’t use the auto welcome message or create one that will make heads turn. Twitter comes with analytics and you can easily do wonders with it. It gives you stats of your readers and Twitter performance which is extremely useful if you want to leverage Twitter to whole new level. One of the biggest mistakes I have seen in many marketers is for them to use the impression count. Ladies and gentlemen, impression count doesn’t really matter! As a matter of fact, it is a metric that is very general. What you need to do is start looking for click-through rates (or CTR) in short for better results. At least, you know what is going on with your readers and what interest them the most. Do you know the average time span of a person looking at a specific tweet on their timeline? 5 seconds is an average. It gets worst when you are following, even more, people and it can be really messy. Now, allow me to take you back to the audience point of view. They are probably experiencing the same with you. Therefore, if you want to get their attention, you got to do something MORE than just sharing tons of posts within a short time period. Your tweet must stand out from the crowd and you can easily do so by having Twitter cards. Here’s a quick guide on Twitter cards and you can easily integrate tons of WordPress plugins along to make your tweet looks more interesting. At the end of the day, no one enjoys reading a lot of tweets and information. Instead, most people are happy to read tweets that provide value to them. So, instead of writing random tweets, change your strategy today and share only powerful information that will drive your traffic and click through up the roof! Should you be using social media tools (or not using at all)? The usage of social media tools for Twitter marketing can really make an impact on how your overall marketing strategy. For starters, you can get more detailed analytics and discover easy ways to manage your Twitter accounts using social media tools. There are also features such as auto-posting, recycling content and much more. I totally understand that one of the biggest concerns is the cost when using social media tools. Not every social media tools are affordable but there are still many which you can start using to take your Twitter marketing to whole new levels. For a disclaimer, some of these tools (under $100 a month) have smaller plans but I feel that higher plans for these tools are more worth the money and effective for small to medium size businesses. Also, it is also important to understand that abusing social media tools (like for spamming) is definitely not advisable at all cost! You know I had this thought last two months, right? The reason for this is simple. Twitter is still working and there are still a large number of following/users there. Just by not using them, you are already losing a huge chunk of opportunity. And you obviously wouldn’t want to lose any, right? I might be wrong but I personally feel that Twitter is here to stay at least for the next 3 to 5 years. So, that’s a long time and thus, you need to start taking action to build a stance on Twitter platform. Start leveraging the Twitter platform and discover how you can build a stronger influence there. Plus, it is going to help you a lot with social media marketing, traffic and visibility at the very least. Twitter may be declining in the recent months but they are certainly not out yet. You should take the opportunity to leverage Twitter as much as possible and more importantly, take steps to avoid simple Twitter mistakes that can affect your marketing reach. With proper targeting, Twitter can really do wonders for you and even grow your business to the whole level. What is your take on this? Have you done any Twitter mistakes before? I am interested in discussing further with you in the comments below.